The spearfisherman's shot was well-placed. 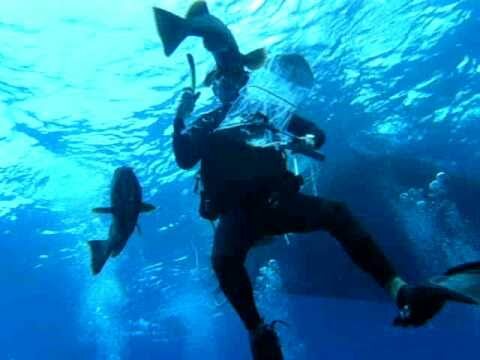 Dinner was practically in the bag; all the diver had to do was swim to and secure his catch. Enter much bigger fish, what looks to be an enormous grouper, which recognizes an easy meal when it sees one. The result is a dramatic clash between a diver who seems more determined to save his arm than the catch, and a powerful fish that clearly enjoys a home-turf advantage. It's not clear where the footage, uploaded this week by YouTube user Worldsubstance, was obtained or who the diver is. A message has been sent to Worldsubstance, who is based in the Netherlands, and this post will be updated with those details if the user responds.